Joining the aircraft carrier crew and commissioning team at the launching ceremony was Russian Deputy Prime Minister Dmitry Rogozin and the Indian Defence Minister A K Antony. In their presence, the transfer and acceptance certificate of the ship was signed by the Deputy General Director of Rosoboronexport Igor Sevastyanov and the aircraft carrier commander Commodore Suraj Berry. 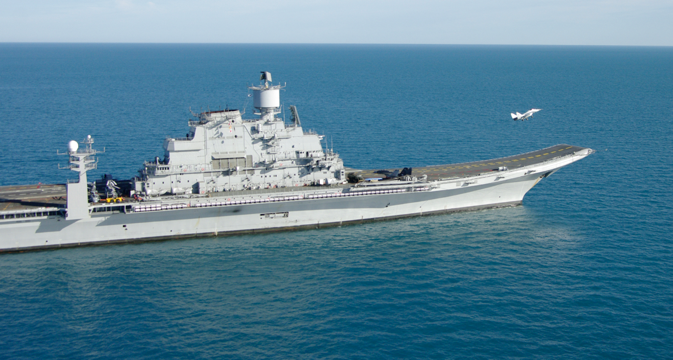 According to Sevastyanov, the induction of this aircraft carrier “is an important step in the development of modern Indian Navy.” After an extensive renovation at the Sevmash shipyard, the Vikramaditya received a modern flight deck and a springboard for take-offs of MiG-29K jet fighters, the latest navigation and radar systems, communication and aircraft control systems, as well as other specialized equipment and assemblies. If the Indian side is interested, Rosoboronexport is ready to build three or four more Project 11356 frigates, armed with BrahMos missiles, according to the press service of Russian defence export company. In June 2013, a Project 11356 frigate, the INS Trikand constructed by the Yantar Baltic Shipyards was transferred to Indian Navy.